Looking for an alternative to metal braces? ClearCorrect is the clear and simple choice. No wires. No brackets. Just clear, convenient comfort—every reason to smile. ClearCorrect invisible braces are the clear and simple way to straighten your teeth so you can show off your smile! You and your doctor will then evaluate your teeth and talk about any problems or goals you have for your smile. 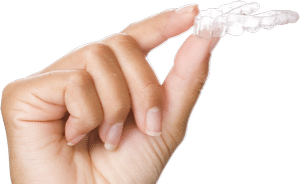 Once you and your doctor establish ClearCorrect is the right treatment option for you, your doctor will take impressions, photos, and x-rays of your teeth that ClearCorrect uses in manufacturing your custom aligners. Your doctor sends your records — your impressions, photos, and x-rays—to ClearCorrect with a prescription for your custom aligners. ClearCorrect uses your records to create exact 3D models of your teeth. Then working with your doctor every step of the way, and following the precise instructions provided on your prescription, ClearCorrect maps out a complete treatment plan of gradual adjustment that takes your teeth from where they are currently to where you and your doctor want them to end up. Once completed, you and your doctor will be able to preview the projected results of your treatment in your “treatment set-up,” a computer representation of your teeth before and after treatment. When you and your doctor are satisfied with the projected results shown in your treatment set-up, the manufacturing process begins. Using the latest digital mapping and molding technology, ClearCorrect creates your custom aligners with computer precision. ClearCorrect then sends your aligners to your doctor for delivery to you. You’ll wear your aligners all the time, except while eating and drinking or during daily tooth care, such as brushing and flossing. Your ClearCorrect aligners are so clear they are barely noticeable so they won’t have an impact on your day to day life. Aligner by aligner, you’ll be able to see the difference as your teeth slowly adjust and align to your target smile. You’ll visit your doctor periodically for checkups to see how you’re progressing until you eventually have the straight smile you’ve always wanted. With the results and convenience ClearCorrect offers and the advantages it has over other treatment options, it’s an easy decision. With ClearCorrect you can get the obvious benefits and confidence you’ll enjoy with straight teeth so you too can show off your smile.